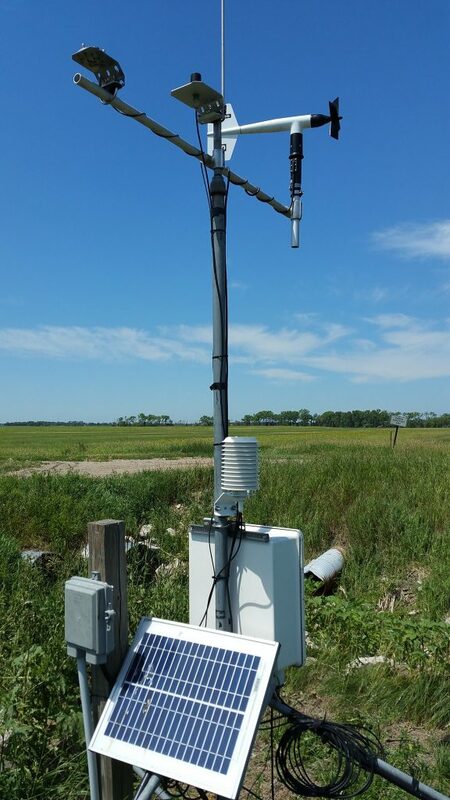 A new record for the highest windspeed ever recorded at an NDAWN station was observed at our station 4 miles south-south-west of Galesburg, ND (Cass County). It occurred on July 4, 2017 at 10:35:45PM local time (2017-07-05, 03:35:45 UTC). The windspeed was recorded at 94.2 mph on a R.M. Young Wind Monitor HD. This event occurred in a thunderstorm associated with a downburst. The previous windspeed record was 93 mph and occurred on September 19, 2014 on the edge of a tornado at the station 7 miles west of Greenbush, MN. Below is the raw data that the station recorded from this event. In the first graph, temperature, dewpoint, and rainfall is graphed. In the second graphic, wind speed and wind direction are plotted. 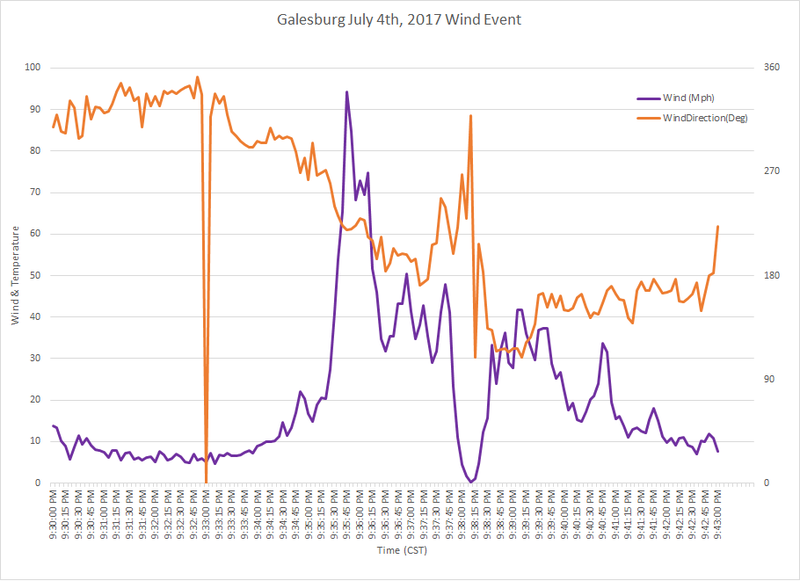 In looking at the data from the above two graphs, it is clear that the wind spiked quickly, rising from 20 mph to 90 mph in just 15 seconds. The wind continued to gust over 65 mph for the next 35 seconds, while also slowly changing direction from north-westerly to south-westerly. Rain also accompanied the gust, with heavy rain starting with the strongest gust and continuing after the gust had passed. The image sequence below is a 3D radar image of the storm the produced the wind gust. In the first couple frames the core of the storm rises as the updraft of the storm grows. Eventually, the updraft subsides and the entire weight of the air (and water, and hail) can no longer be supported. 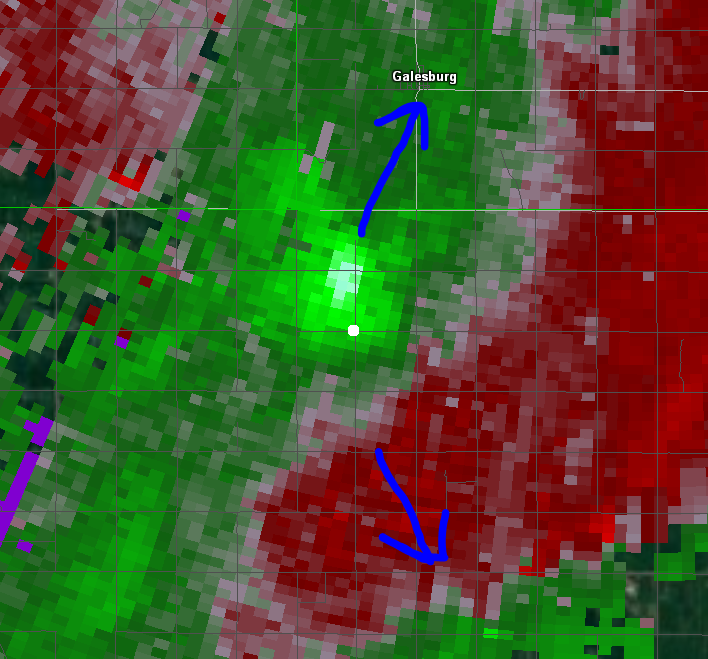 It then comes crashing down nearly directly hitting the Galesburg station. The result of the air hitting the ground is large amounts of air rushing away from the zone of impact. Doppler radar can analyze this movement of air and determine where (roughly) it is moving.The “doppler” part of doppler radar determines whether air (and other things) are moving toward or away from the radar. For weather doppler radar this is often depicted as red and green colors, where red is moving away from the radar and green is moving towards the radar. 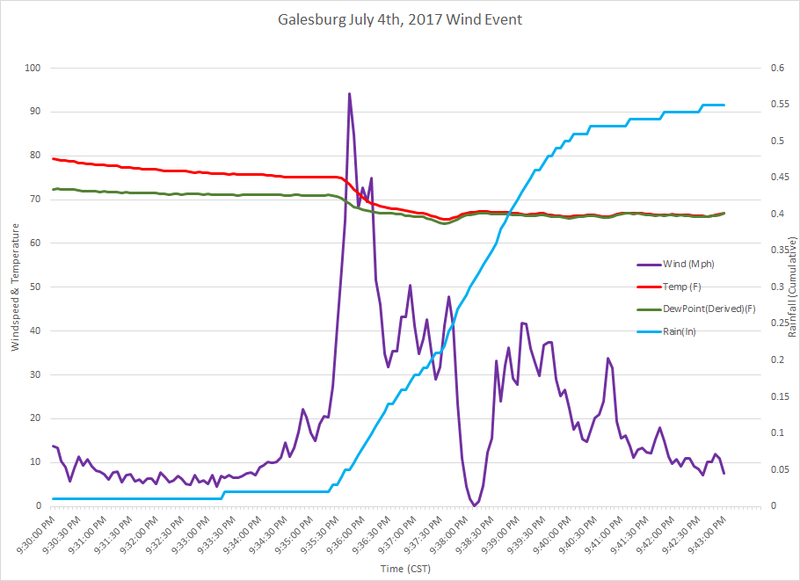 In the image below we can see that the wind is moving away from the Galesburg station (White Dot) at about a minute after the 94 mph wind gust was recorded. The station itself did very well with the event and survived everything the storm threw at it. NDAWN staff visited the site the next day to check in on it and despite the wind, it fared remarkably well. On to record another day.